I saw a video a few months ago that instantly left a mark on my heart. This video showed how many Haitian women make, sell and eat Bon Bon Terre cookies just to survive. Also known as mud cookies, mud cakes and dirt biscuits these dirt cookies are made of clay(dirt) water, and very little shortening and occasionally sugar. I couldn't believe women and children had to live this way and so with the heaviness on my heart for days the Lord showed me a way to help and so, Arina project was born. Many ministries provide water and/ or water wells, I want to provide flour for both inhabitants of the Hispaniola border, Dominicans and Haitians. 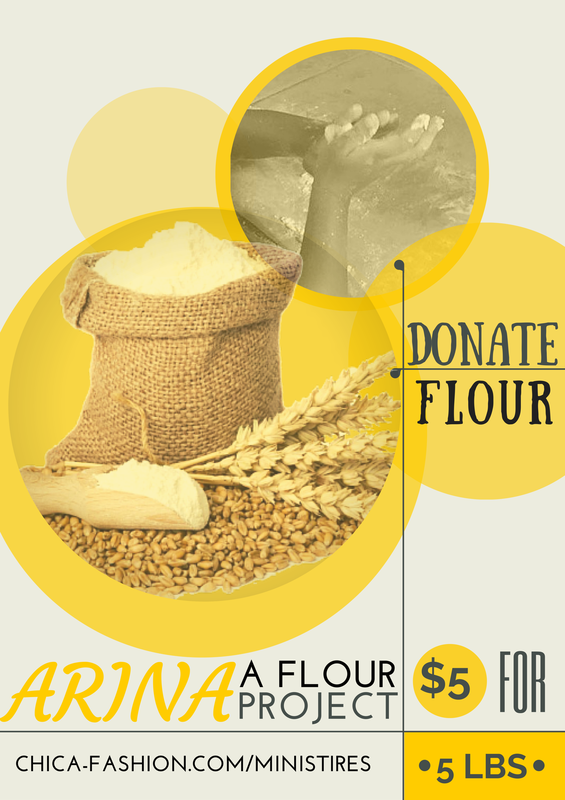 For just the small amount of $5 you are able to provide a 5lb bag of flour to two families! The amount of foods that can be prepared from just one 5 pound bag of flour are plentiful. Our first goal is to provide 300 families with a bag 5lb bag of flour. The women don't just use dirt from the street they actually buy it! Dirt to make a hundred cookies now costs U.S. $5, the cookie makers say. The cookies are sold at 5 cents each. Merchants truck the dirt from the central town of Hinche to the La Saline market. Women buy the dirt, then process it into mud cookies in places such as Fort Dimanche, a nearby shantytown. Your $5 donation will provide one 5 pound bag of flour for 2 families! The flour can be used to make on average 300 2" eggless butter cookies. The flour can also be used in any of array of dishes. This flour combined with water from other ministries can help feed these women and children. The money donated goes toward purchasing, shipping and handling of the flour. I will deliver the flour on my next trip and will also be partnering with other ministry teams to have them deliver and disperse the flour when I can not. I thank you in advance for your donation, God bless you!